Calendula aurantiaca Kotschy ex Boiss. Calendula prolifera Hort. ex Steud. Calendula officinalis, the pot marigold, ruddles, common marigold or Scotch marigold, is a plant in the genus Calendula of the family Asteraceae. It is probably native to southern Europe, though its long history of cultivation makes its precise origin unknown, and it may possibly be of garden origin. It is also widely naturalised further north in Europe (as far as southern England) and elsewhere in warm temperate regions of the world. The Latin specific epithet officinalis refers to the plant’s medical and herbal uses. Calendula officinalis is a short-lived aromatic herbaceous perennial, growing to 80 cm (31 in) tall, with sparsely branched lax or erect stems. The leaves are oblong-lanceolate, 5–17 cm (2–7 in) long, hairy on both sides, and with margins entire or occasionally waved or weakly toothed. The inflorescences are yellow, comprising a thick capitulum or flowerhead 4–7 cm diameter surrounded by two rows of hairy bracts; in the wild plant they have a single ring of ray florets surrounding the central disc florets. The disc florets are tubular and hermaphrodite, and generally of a more intense orange-yellow colour than the female, tridentate, peripheral ray florets. The flowers may appear all year long where conditions are suitable. The fruit is a thorny curved achene  and weight in average 10.1 mg (n=50). Calendulas are used as food plants by the larvae of some Lepidoptera species including Cabbage moth, Gothic moth, Large yellow underwing, and Setaceous Hebrew character. Calendula officinalis is widely cultivated and can be grown easily in sunny locations in most kinds of soils. Although perennial, it is commonly treated as an annual, particularly in colder regions where its winter survival is poor, and in hot summer locations where it also does not survive. Calendulas are considered by many gardening experts as among the easiest and most versatile flowers to grow in a garden, especially because they tolerate most soils. In temperate climates, seeds are sown in spring for blooms that last throughout the summer and well into the fall. In areas of limited winter freezing, seeds are sown in autumn for winter color. Plants will wither in subtropical summer. Seeds will germinate freely in sunny or half-sunny locations, but plants do best if planted in sunny locations with rich, well-drained soil. Pot marigolds typically bloom quickly from seed (in under two months) in bright yellows, golds, and oranges. Leaves are spirally arranged, 5–18 cm long, simple, and slightly hairy. The flower heads range from pastel yellow to deep orange, and are 3–7 cm across, with both ray florets and disc florets. Most cultivars have a spicy aroma. It is recommended to deadhead (remove dying flower heads) the plants regularly to maintain even blossom production. Numerous cultivars have been selected for variation in the flowers, from pale yellow to orange-red, and with ‘double’ flowerheads with ray florets replacing some or all of the disc florets. Examples include ‘Alpha’ (deep orange), ‘Jane Harmony’, ‘Sun Glow’ (bright yellow), ‘Lemon’ (pale yellow), ‘Orange Prince’ (orange), ‘Indian Prince’ (dark orange-red), ‘Pink Surprise’ (double, with inner florets darker than outer florets) and ‘Chrysantha’ (yellow, double). ‘Variegata’ is a cultivar with yellow variegated leaves. The cultivar group ‘Fiesta Gitana’ has gained the Royal Horticultural Society’s Award of Garden Merit. Pot marigold florets are edible. They are often used to add color to salads or added to dishes as a garnish and in lieu of saffron. The leaves are edible but are often not palatable. They have a history of use as a potherb and in salads. Flowers were used in ancient Greek, Roman, Middle Eastern, and Indian cultures as a medicinal herb, as well as a dye for fabrics, foods, and cosmetics. Many of these uses persist today. They are also used to make oil that protects the skin. Marigold leaves can also be made into a poultice that helps scratches and shallow cuts to heal faster, and can help prevent infection. The petals and pollen of Calendula officinalis contain triterpenoid esters and the carotenoids flavoxanthin and auroxanthin (antioxidants and the source of the yellow-orange coloration). The leaves and stems contain other carotenoids, mostly lutein (80%), zeaxanthin (5%), and beta-carotene. Plant extracts are also widely used by cosmetics, presumably due to presence of compounds such as saponins, resins, and essential oils. The flowers of Calendula officinalis contain flavonol glycosides, triterpene oligoglycosides, oleanane-type triterpene glycosides, saponins, and a sesquiterpene glucoside. Plant pharmacological studies have suggested that Calendula extracts may have anti-viral, anti-genotoxic, and anti-inflammatory properties in vitro. In an in vitro assay, the methanol extract of C. officinalis exhibited antibacterial activity and both the methanol and the ethanol extracts showed antifungal activities. Along with horsetails (Equisetum arvense), pot marigold is one of the few plants which is considered astringent despite not being high in tannins. ^ The Plant List, Calendula officinalis L.
^ a b c d The New RHS Dictionary of Gardening 1: 462. ^ a b “Calendula officinalis – L.” Plants For A Future. June 2004. Retrieved 2007-12-19. ^ Flora of China, 金盏菊 jin zhan ju Calendula officinalis Linnaeus, Sp. Pl. 2: 921. 1753. ^ Altervista Flora Italiana, Calendola medicinale Calendula officinalis L.
^ Harrison, Lorraine (2012). RHS Latin for Gardeners. United Kingdom: Mitchell Beazley. ISBN 978-1845337315. ^ “RHS Plantfinder – Calendula officinalis Fiesta Gitana Group”. Retrieved 12 January 2018. ^ “AGM Plants – Ornamental” (PDF). Royal Horticultural Society. July 2017. p. 13. Retrieved 6 February 2018. ^ Arana, Lide; Salado, Clarisa; Vega, Sandra; Aizpurua-Olaizola, Oier; Arada, Igor de la; Suarez, Tatiana; Usobiaga, Aresatz; Arrondo, José Luis R.; Alonso, Alicia (2015-11-01). “Solid lipid nanoparticles for delivery of Calendula officinalis extract”. Colloids and Surfaces B: Biointerfaces. 135: 18–26. doi:10.1016/j.colsurfb.2015.07.020. PMID 26231862. ^ National Institutes of Health. “Calendula”. Herbs and Supplements. U.S. National Library of Medicine. Retrieved 2007-12-19. ^ Ukiya M; Akihisa; Yasukawa; Tokuda; Suzuki; Kimura (2006). 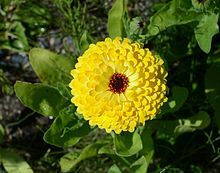 “Anti-inflammatory, anti-tumor-promoting, and cytotoxic activities of constituents of pot marigold (Calendula officinalis) flowers”. J Nat Prod. 69 (12): 1692–1696. doi:10.1021/np068016b. PMID 17190444. ^ Yoshikawa M; Murakami; Kishi; Kageura; Matsuda (2001). “Medicinal flowers. III. Marigold. (1): hypoglycemic, gastric emptying inhibitory, and gastroprotective principles and new oleanane-type triterpene oligolycosides, calendasaponins A, B, C, and D, from Egyptian Calendula officinalis”. Chem Pharm Bull. 49 (7): 863–70. doi:10.1248/cpb.49.863. PMID 11456093. ^ Jimenez-Medina E; Garcia-Lora; Paco; Algarra; Collado; Garrido (2006). “A new extract of the plant Calendula officinalis produces a dual in vitro effect: cytotoxic anti-tumor activity and lymphocyte activation”. BMC Cancer. 6: 119. doi:10.1186/1471-2407-6-119. PMC 1513589. PMID 16677386. ^ Efstratiou E; Hussain; Nigam; Moore; Ayub; Rao (2012). “Antimicrobial activity of Calendula officinalis petal extracts against fungi, as well as Gram-negative and Gram-positive clinical pathogens”. Complement Ther Clin Pract. 18 (3): 173–176. doi:10.1016/j.ctcp.2012.02.003. PMID 22789794. Aro, A.A.; Perez, M.O. ; Vieira, C.P. (February 2015). “Effect of Calendula Officinalis Cream on Achilles Tendon Healing”. The Anatomical Record. 298 (2): 428–435. doi:10.1002/ar.23057. PMID 25266273.